A protected area of the Rawa Singkil Wildlife Reserve in Indonesia is burned March 3, 2018, for a new palm oil plantation. The rule, which the European Commission—the EU’s executive arm—is required to propose by Feb. 1, would define which feedstocks used in biofuel production are sustainable in terms of forest clearance and other land-use changes. It is “pretty sure” that palm oil producers will lose out under the rule, “basically because of Indonesia, where there is tremendous land-use change,” Gernot Klepper, senior researcher and head of environment and natural resources research at Germany’s Kiel Institute for the World Economy, told Bloomberg Environment. While palm oil faces phaseout, soybeans from the U.S. could take their place as a feedstock for EU biofuel. The EU forecasts that soybean imports from the U.S. will increase from 39 percent—or 2,439 metric tons in marketing year 2017-2018—to 75 percent, or 5,182 metric tons, in 2018-2019. The requirement for an EU ILUC rule was triggered by a law on renewable energy, finalized last December, stipulating that the EU must meet at least 32 percent of its energy needs from renewable sources by 2030. The law also specifies that by 2030, 14 percent of transportation fuel consumed in the EU must come from renewable sources, including liquid biofuels and biogas. “We are already decreasing the use of palm oil, progressively substituting it with waste residues and used cooking oil, with the aim of phasing it out completely,” said a spokesman in Rome for oil and gas company Eni SpA. “That said, the availability of alternative feedstock is limited for the time being, which means that fully phasing out palm oil will only be possible once alternative feedstock become easily available. That is why the EU rules should not be equivalent to a “hidden ban” by being very difficult to implement or limited to very particular cases,” he added in a Jan. 22 email. When the commission proposes its rule, it could specify certain crops—such as palm oil—but allow exemptions where appropriate, or it could “focus on the areas that have a high risk of land-use change,” Klepper said. However the EU defines the rule, it is sure to cause some dissatisfaction as significant trade is at stake. 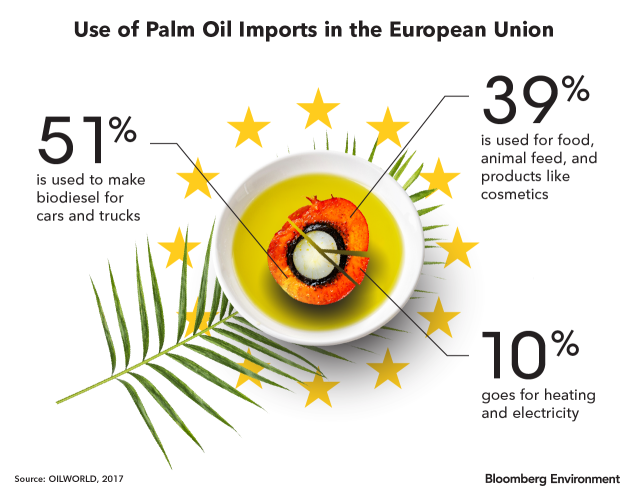 Just over half (51 percent), or 3.9 million metric tons, of crude palm oil imported into the EU in 2017, largely from Malaysia and Indonesia, was processed into biodiesel, according to the European vegetable oil and proteinmeal industry federation (FEDIOL) in Brussels. Malaysia and Indonesia have pushed back against possible limitations on EU palm oil imports. They declined to take part in a November 2018 workshop with EU representatives and said an EU indirect land-use change rule that effectively prohibits palm oil in biofuel could violate World Trade Organization rules and trigger retaliation. Indonesian trade attache in Brussels Merry Indriasari told Bloomberg Environment that she wasn’t able to comment until the European Commission publishes its proposed rule. Conie Liew Yit Siam, an official at the Embassy of Malaysia in Brussels, said she was unable to comment. The rule could have limited initial effects, because EU producers will continue to process palm oil for food and chemical use, according to Nathalie Lecocq, director general of FEDIOL in Brussels. Minnetonka, Minn.-based Cargill Inc. said in a statement to Bloomberg Environment that it “supports biofuels production and use that proves to be environmentally beneficial, and which helps reduce greenhouse gas emissions and contributes to net carbon neutrality. White Plains, N.Y.-based Bunge Ltd. spokesman Frank Mantero and Archer Daniels Midland Co. spokeswoman for Europe and Africa Aurelie Giles referred a request for comment to FEDIOL. The likely boost for U.S. soybeans from the biofuels rule also should be seen in the context of the U.S. “pushing soy to the European market under the Trump administration,” Klepper said. U.S. soybean exports to China—the world’s largest buyer—plummeted in 2018 when the two countries began to levy tariffs on one another as a consequence of President Donald Trump’s trade policy. 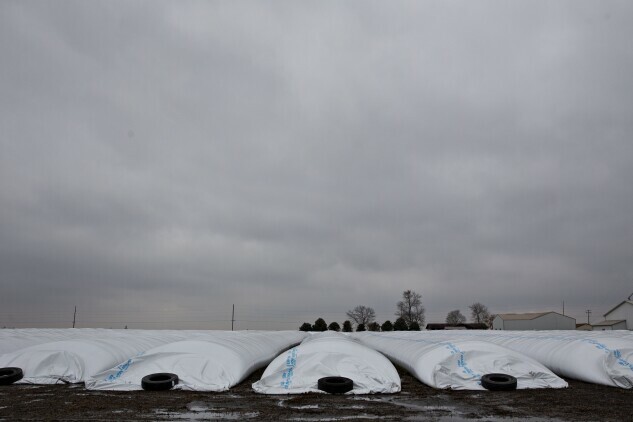 Caught in the middle of the U.S.-China trade war, bags of soybeans sit Nov. 9, 2018 at a farm in Lovington, Ill.
Trump also threatened tariffs on the EU. To head off the threat, European Commission President Jean-Claude Juncker went to the U.S. in July 2018 and promised to promote increased EU purchases of U.S. soybeans. There is some evidence the move is already working in terms of the soybean oil in biodiesel in the EU: A Belgian study that a group of nonprofit organizations released Jan. 21 found that the amount of soy oil in biodiesel in Belgium increased tenfold in 2018, while the amount of palm oil dropped. The European Commission has started a process to recognize U.S. soybeans as a sustainable feedstock for EU biofuels. In December 2018, it published a draft decision acknowledging that the U.S. Soybean Sustainability Assurance Protocol met EU biofuels sustainability criteria. Recognition of that program applies under the current rules, which will be replaced by the new renewable energy law and associated indirect land-use change rules. From the point of view of limiting deforestation related to palm oil, the EU ILUC rule might make little practical difference, according to Anja Lillegraven, Indonesia team leader at the Rainforest Foundation Norway. Global demand for palm oil is growing and the EU rule might “reduce the increase in demand but it will not decrease the demand,” she said.